The building was built in 1893 and completed in 1894. This is a remarkable design by Arthur Bishop Chamberlin (1865-1933), who was known for his many skillful illustrations in pen and ink of Seattle buildings. These appeared in journals of the time such as American Architect and Northwestern Architect between 1890 and 1894. Before his move to Seattle in 1890, Chamberlin worked as a draftsman for Long and Kees, whose work followed the Richardsonian Romanesque tradition, in Minneapolis. He also developed consummate rendering skills under Harvey Ellis, considered a leading architectural delineator of his day. In Seattle, he worked for Saunders and Houghton, John Parkinson, the architect of the Seattle National Bank Building/ Interurban Building and briefly for William Boone, the architect of the Merchant’s Café Building and of the Globe Building. He had an independent practice by 1893. 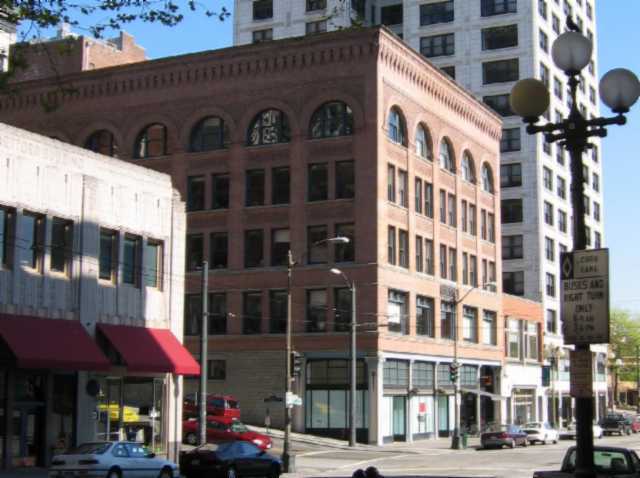 Jeffrey Ochsner has noted the obvious influence of Burnham and Root’s Fidelity Trust Company Building in Tacoma and the less obvious influence of Adler and Sullivan’s Walker Warehouse. Subsequently, Chamberlin won few commercial commissions. Unfortunately there are few known examples of buildings, which showcase his architectural talents. The building was commissioned by John Collins, an important figure in early Seattle. Born in Ireland in 1835, Collins moved to New York around the age of ten. He worked in Maine in the lumber business before moving to Port Gamble in the 1850s to work in the Puget Mill Company. He arrived in Seattle in the 1860s and by the 1870s, became something of a Seattle civic leader: He served on the city council, as mayor and in the territorial legislature. He was also an important Seattle entrepreneur and invested in Seattle real estate, in mining properties as well as the Walla Walla Railroad. Collins is known for commissioning the pre-fire Occidental Hotel, an elegant Victorian building on the site of the present Sinking Ship Garage on Yesler Way and originally designed by Donald Mackay. After its destruction in the Great Fire of June 6, 1889, Collins, undeterred by the Fire, commissioned Stephen Meany, who had worked in Mackay’s office and was the nephew of Edmond Meany, (the historian and once president of the University of Washington), to design a new hotel, known as the Occidental Hotel and then later as the Seattle Hotel (and the “Hotel Seattle,” as well). (The subsequent destruction of this last building in the 1960s was a major factor in the creation of the movement to save Pioneer Square). Sited on the southeast corner of Second Avenue and James Street, the Collins Building main elevation faces Second Avenue and has a second street elevation along James Street. Rectangular in plan, (80’ x 108’ for a typical floor), the building is five stories in height with a mezzanine level above the first floor, as well as a partial basement level. The building’s roof is not visible from the street, but the building has a parapet. (In fact, the southern third of the roof is almost flat. There is a small skylight near the center of the roof and a low vaulted roof covers the remainder of the building). In general, the building exterior is clad in brick with a cast-iron and wood storefront at the first level of the main façade and rusticated sandstone on the first level of the James Street elevation. Sandstone trim is also used on the upper brick clad levels. The main façade on Second Avenue is symmetrically composed except that the main entrance is placed at the fifth bay, counting from the north. 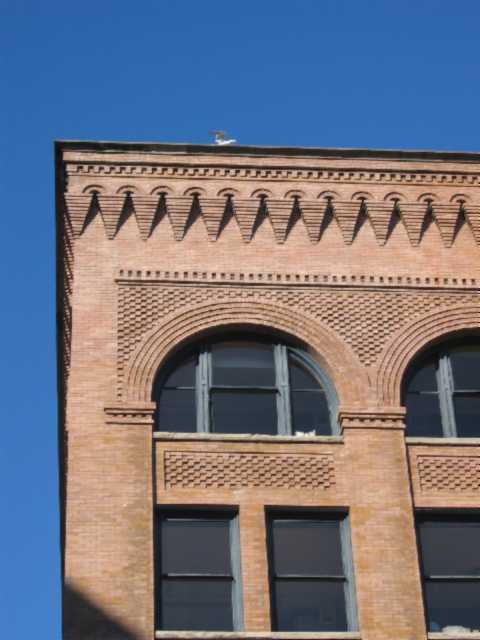 While the ground floor clerestoried storefront consists of cast-iron pilasters with Corinthian capitals and floral ornamentation at the top of pillar shafts, the upper floors are clad in buff brick with thin sandstone belt courses and window sills. The second floor has five bays, with wide rectangular windows with clerestories, each of which is divided into three lights. Above the second floor, each bay consists of a double set of double-hung windows at the third and fourth floors, surmounted by a semi-circular opening at the top floor, with a double hung window at its center. The ground level on the James Street elevation has one bay of cast-iron storefront facing west, followed by sandstone blocks of varying sizes. The rusticated level disappears as the grade of the street rises toward Third Avenue. The upper levels of the James Street elevation are consistent with that of the main façade. The building is remarkable for the detailing in buff brick which pulls the composition of the elevations together, particularly on Second Avenue. Bricks are arranged to create an interesting variety of texture and pattern in the spandrels between floors and over the arches. Ornamental bricks arranged in arched semi-circles further accentuate the arched openings. At the parapet level, corbelled bricks in pyramid-like shapes (turned upside down) punctuate the top of the walls and are surmounted by small ornamental arches. This band is surmounted by a band of brick dentils, topped by slightly projecting brick and then a slightly projecting cornice – which is a concave shape surmounted by a flat band. Ochsner, Jeffrey and Dennis Andersen. Distant Corner: Seattle Architects and The Legacy of H. H. Richardson. Seattle and London: University of Washington Press, 2004. “Artists in Building. Points of Professional Ethics among Architects. Standard of the Art Rising. Two New Wholesale Blocks on Main Street – Plans for the New Presbyterian Church – Collins’ Block,” Seattle Post-Intelligencer, 13 March 1893, p 5. “Progress in Building,” Seattle Post-Intelligencer, 8 October 1893, p 8. Ochsner, Jeffrey, “A. B. Chamberlin: The Illustration of Seattle Architecture, 1890-96,” Pacific Northwest Quarterly 81/4 (October 1990), 130-144. Samis Foundation. “Collins Building,” “Historic Preservation Certification Application, Part 1.” 10 September, 1998, OAHP, State of Washington, Olympia, Washington, Microfiche File. “Progress in Building,” Seattle Post-Intelligencer, 8 October 1893, p 8. “Progress in Building,” Seattle Post-Intelligencer, 8 October 1893, p 8. Link, Karin, “The Rise of the Urban Center,” in Andrews et al. Pioneer Square: Seattle’s Oldest Neighborhood. Manuscript. Seattle and London: University of Washington Press, forthcoming 2005.